Apologizes for the lack of Orphan Black on here of late. Been busy the past few Saturdays so it is hard to be timely for our recaps. But we are back with recapping the second episode. The gist of the first episode is that Sarah encountered a creature in the woods prior to be captured by Rachel, Cosima got administered the cure by Rachel, Alison got captured by Art and his new partner, Detective Maddy Engler, and Donnie and Helena escaped the woods before they can get captured but Helena gets a stick in her pregnant abdomen. Alison is back in her craft room and being pressured by Art and Maddy about Donnie and Helena’s whereabouts. Alison doesn’t know where her husband and sestra are but Art and Maddy are insistent on Alison finding out where they are. Donnie and Helena are in a hospital. Helena is fine and the stick has been removed. The neonatal doctor is a bit concerned about one of the twins because the stick got a little too close for her liking. Helena, however, doesn’t want the doctor near her or her babies. The doctor gets more concerned when another ultrasound reveals that the baby is fine now (it appears that the baby healed itself). Security gets called in to speak to Donnie while the doctor tries to perform an amniocentesis. What ends up happening is that Helena grabs the needs and stabs the doctor in the cheek with it and escape. In all the chaos, Donnie slips out too. Cosima is still on Revival island and is curious about Aisha the new Muslim girl with cancer. Charlotte tells Cosima all about Aisha and helps her examine Aisha. Cosima then gets called in to meet PT Westmoreland (Stephen McHattie). In their meeting, Westmoreland offers Cosima access to his lab to continue on her research for the cure. Sarah wakes up in Dyad with Rachel wanting her cooperation in being able to study Kira. If Sarah gives it, then she and Kira can be reunited. Sarah refuses the offer but changes her mind when she sees that Mrs. S is working with Rachel. Once home, Sarah is reunited with Felix who also looks like he is working with Rachel. 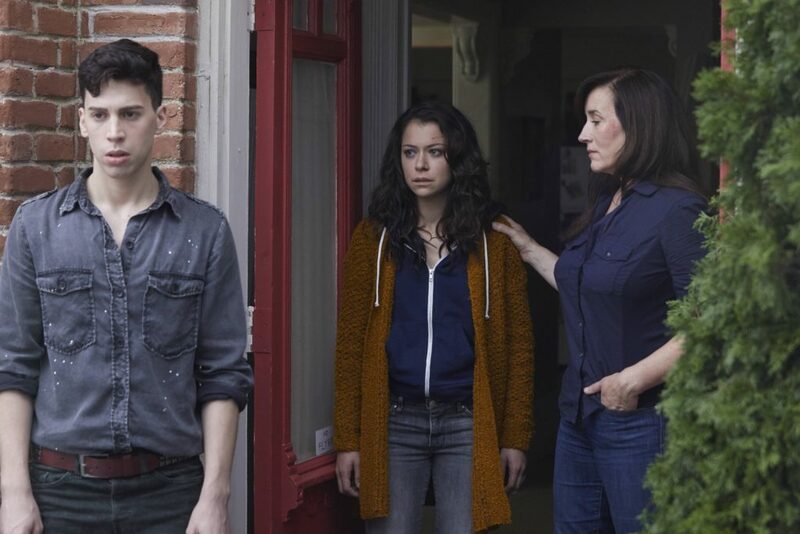 However, once alone that is not the case as Felix and Mrs. S have come up with a plan to whisk Sarah and Kira away from Rachel. But this plan all depends on getting MK’s help. To make it look like they are going along with Rachel’s plan, Sarah takes Kira to school but Rachel will pick her up. At the comic book store, Felix needs Ira to be their inside man on Rachel’s team and tasks him to go back to the island. Scott lets Felix know they’ve made contact with MK who happens to be in Felix’s loft. At Felix’s loft, he seems to get MK to help and also to go with them so she can get the cure as her illness has progressed. The plan gets enacted with Sarah pretending to be Rachel to collect Kira. As Rachel arrives, Sarah sees her men all around the school but luckily with the help of Mrs. S, they manage to escape. A snag is hit when MK doesn’t follow through on her part forcing Sarah to go to Felix’s loft to collect her. Unfortunately, Ferdinand has followed Sarah to the loft. Once at the loft, Sarah cannot convince MK to come with her. With Ferdinand approaching, MK gives Sarah more time by switching closes. Sarah makes it out just as Ferdinand breaks into the loft. Ferdinand is pissed at MK for stealing his money last season but he also seems to be taking out his anger about Rachel on her too. Earlier on the episode, Rachel seems to have dismissed Ferdinand from her favour. Ferdinand is so pissed at MK that he starts to brutally stomp on her chest over and over again eventually killing her. Meanwhile, Sarah, Mrs. S, Felix and Kira have made it to the meeting area to flee to safety. Kira has sensed that MK has died and refuses to go away with her mother as she wants to know why she is the way she is and wants to go to Rachel to get answers. Sarah tries to force Kira to go with her but she is insistent on wanting to go to Rachel. Seeing this, Mrs. S tells Sarah to let Kira go to Rachel. Devastated, Sarah tearfully sees her daughter go off with her sworn enemy. After an eventful day, Mrs. S quiet moment with a glass of scotch is interrupted by a visit from Delphine who needs Mrs. S help but Sarah cannot know about it.